The Culfin Fishery is located approximately half way between Clifden and Westport in the beautifully scenic area of Connemara. This fishery is situated 6 miles west of Leenane and is comprised of the Culfin River, Lough Muck and Lough Fee. Access to the fishery is easy as the Leenane-Tully Cross Road runs along the shore of the lakes and close to the river in several places. The fishery offers Salmon, Sea Trout and Brown Trout fishing on two lakes and a river. Fly fishing is recommended but we also allow spinning with barbless hooks. The lakes, Lough Fee and Lough Muck, may be fished from the bank or by boat. Fishing equipment is available to hire. This year the fishery is fully open for Salmon with no quota restrictions. As in previous years all Sea Trout must be returned. 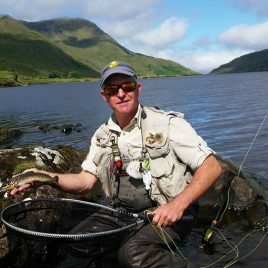 Full details of the rules regarding Salmon and Sea Trout fishing in Ireland can be found on the Central Fisheries Board website. All anglers should also have a government licence which is required when fishing for Salmon or Sea Trout anywhere in Ireland. These can be purchased at the fishery office. We now have a fish counter on the river which is giving us accurate figures for Salmon and Sea Trout entering and leaving the system. This will allow us to build up a profile for average annual and monthly numbers within the fishery.